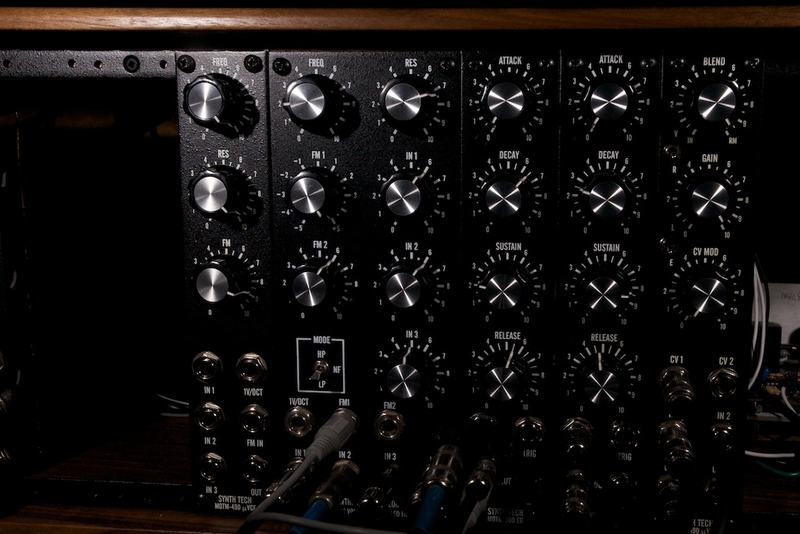 MUFF WIGGLER :: View topic - Post pics of your 5U format setup! Post pics of your 5U format setup! My pic needs an update, but I'll be adding three modules in the next few weeks so I'll wait on that. @synthetic - you did a really good job with that cabinet. yup, i'm a bit of an LFO junky. 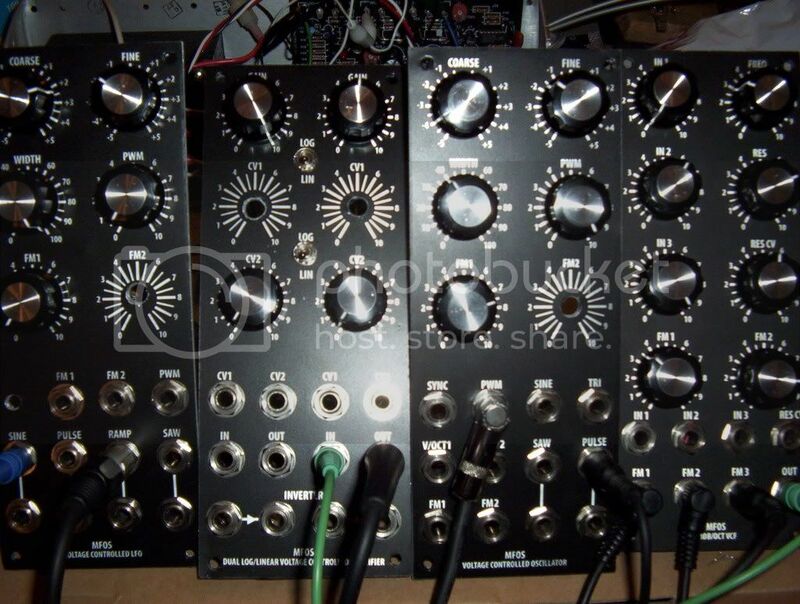 i've got another two, or 6 depending on how you look at it, arriving sometime soon - Modcan Dual LFO and Modcan Quad LFO. i'll post some pics when they arrive. 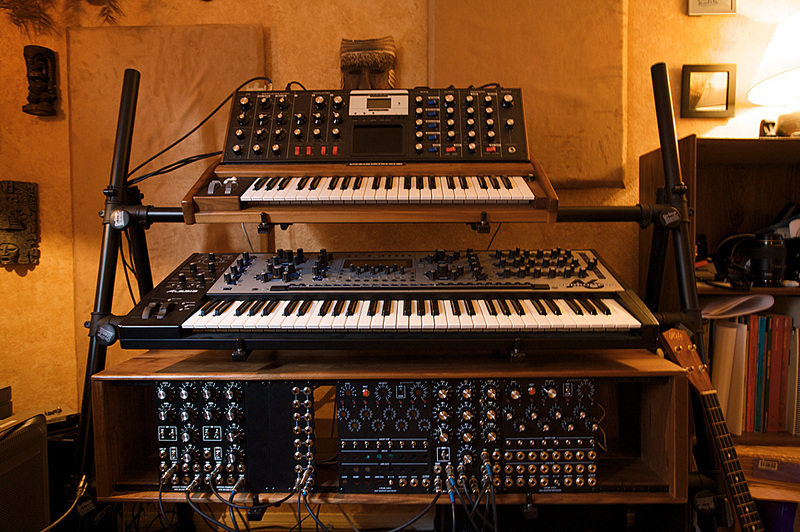 which sequencer are you hoping to get working? 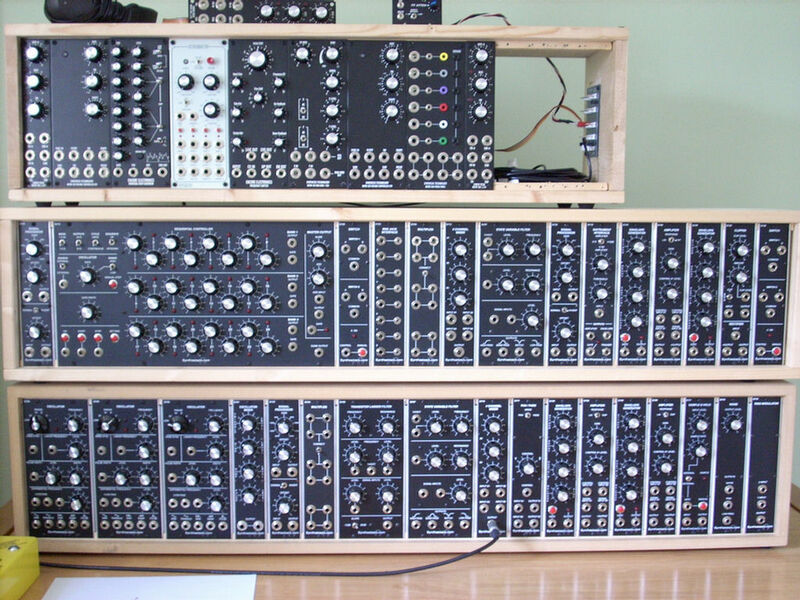 The two small sequencer panels are Bridechamber/CGS projects. This DotCom isn't mine, but belongs to my friend Shikhee from the band Android Lust. They're actually rather old pics - I need to take some newer ones, as she's since filled the first cabinet, and added a second with a Q119 in it. Thanks! I'll try to get some new shots next time I'm over there. I've since gotten tired of MOTM standard layouts so come back later and we'll kick it up another notch. Will post more pics when the cabinet is finally full. 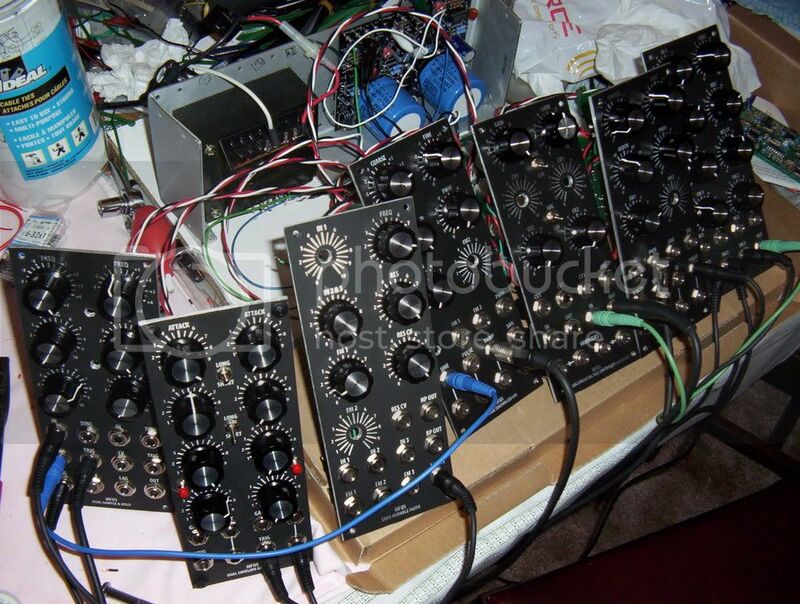 Just got happy mail from Synthtech and Bridechamber so these guys are about to get new friends. i'm waiting for a happy email from paul too - hopefully it should be soon according to the update email he sent out today. make sure you post a pic when the new toys arrive! Loads of fun with drum loops. I love it when it has a hard time tracking and just spits and sputters. Beautiful! I plan on starting a Euro system as soon as I fill up another 22space cab. I will expand my system with motm and modcan stuff. The Woggel Bug is buit and a Bin-Tic is on its way. 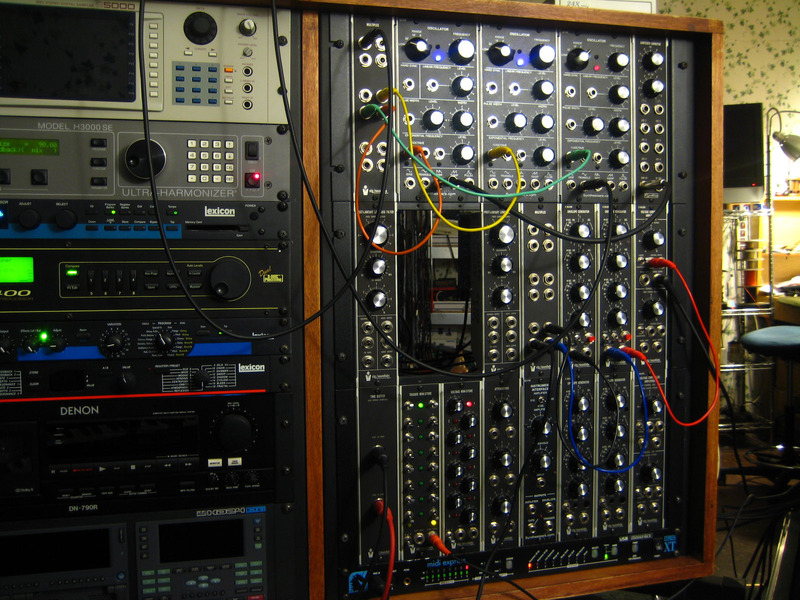 I like the saturation of a 15V System because it sounds totaly different compared to a 12V eurorack. Its good to have both but it is very hard to take care for 2 systems. I only have a low income and it takes it time. What you see took 5-6 years with an empty fridge sometimes. BTW: On the right corner you can see my syncussion. Take one if you have the opportunity!!! Yea, it took me about 8-9 months to fill my Dot Com cab up. 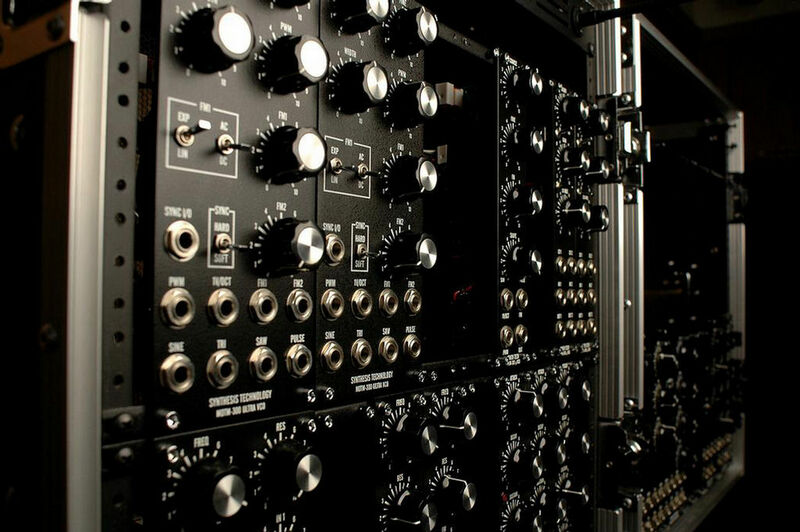 I'm interested in the Analogue Solutions drum modules though. that's what i did after 2 x 22 space dotcom cabinets. i like the mixture i have now of straightforward vs more esoteric modules. Sandy, are your two Dot Com cabs DIY jobs? 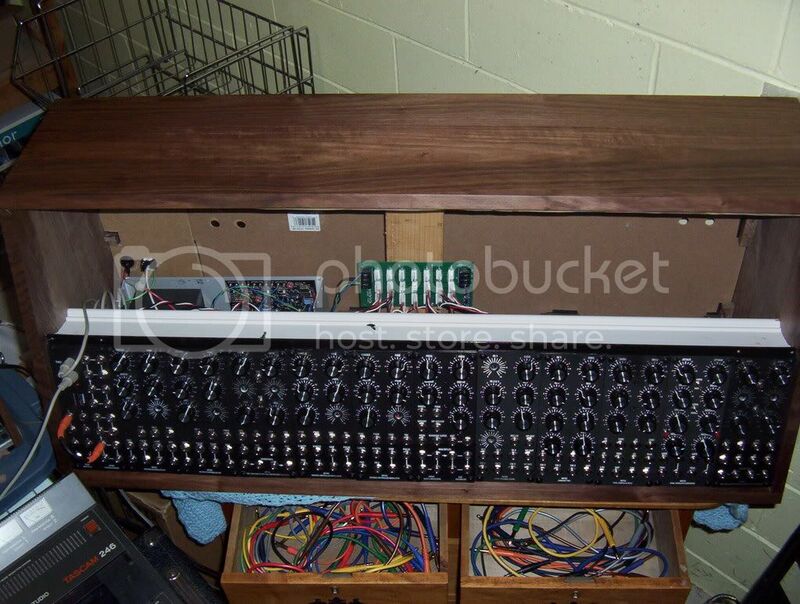 If so, what type of wood did you use for both the case and mounting rails? Looks good, but I do want to keep cost at a minimum. Thanks Sandy, I've seen the DIY cab article. I just don't like the Rubbermaid shelves that Rogger suggests. They do look nice, but they are too short for a full 22 space cab and they won'nt match my entry level cab. For $50, sounds like pine is the way to go then.